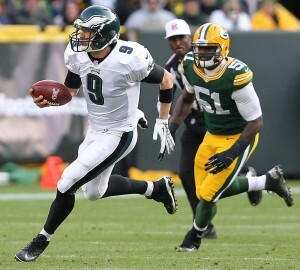 Eagles Eye Week 10: Is Foles the future at QB? Quarterback Nick Foles of the Philadelphia Eagles scrambles for yardage against the Green Bay Packers during the third quarter at Lambeau Field in Green Bay, Wis., Nov. 10. The Eagles beat the Packers, 27-13. This week, Philadelphia will be buzzing about Nick Foles’ impressive passer rating of 132.5 and the fact that he has thrown 16 touchdowns and no interceptions in seven starts. Young fans will likely make a concentrated effort to vote Foles into the Pro Bowl. Meanwhile, countless sidewalk conversations will include pledges of support for head coach Chip Kelly and admittances that his offense does indeed work. But as exciting as “Foles Mania” has been for the past two weeks, let’s not lose sight of the way he played only four weeks ago against the Dallas Cowboys. Foles went 11 for 29 for 80 yards and no touchdowns, leading to a devastating divisional loss, which happens to be the reason the 5-5 Eagles are still behind the 5-5 Cowboys in the NFC East by virtue of the head-to-head tiebreaker. After that game, fans were calling for Foles’ release and some even for the firing of Kelly. Also, keep in mind that the Eagles have played two down-and-out teams over the last two weeks. After their loss to the New York Giants Nov. 10, the Oakland Raiders are 3-6 and far from a playoff team. Not to mention that a Green Bay Packers team without Aaron Rodgers is far from threatening, especially when third-stringer Scott Tolzien — who had been on the practice squad a week prior — played the majority of the game at quarterback. Since the Donovan McNabb era has ended, consistency — other than the play of LeSean McCoy and the losing of home games — has been a rarity for the Eagles. Remember the excitement that fans felt after the week 1 thrashing of the Washington Redskins? Going into week 2, everyone thought Michael Vick was “the man” and that Kelly’s offense would be unstoppable. But then the San Diego Chargers stopped it, and the Eagles went 2-5 over the next seven weeks. That brought us to “Foles Mania,” where Foles is now “the man” and Kelly’s offense once again looks unstoppable. So the real question is, how will this team look another seven weeks from now? Will the Eagles be preparing for a playoff opponent with a franchise quarterback at the helm or be preparing for a long offseason full of difficult choices, Possibly including a new quarterback? You know, Fresno State’s Derek Carr sure looks impressive.